Everyone wants better attendee engagement, and technology has promised to deliver. How does one help the other? Attendee engagement is hot on the lips of every event professional these days. But what exactly does it mean? As organizers, we want the content that we’ve put our blood, sweat, and tears into creating to truly connect with the audience who has come to experience it. This is mission critical to the success of both your event and your app. Event technology has promised that it will be able to deliver a more engaging experience for your attendees. But what is it about having your event’s content in the audience’s hands that makes the difference? The honest truth is that the way in which an app delivers content has everything to do with how your app’s users will experience it. That’s why Guidebook developed Interact – a dynamic social feed that ensures users find relevant and interesting information in an instant, every time they open the app. Your objective is to bring people together so they can discover, share and leave reenergized – choose an event app that supports you along the way! Interact is a feature that you can add to your app that serves as a one-stop home screen for your event. It organizes content from the app into cards that appear exactly when they’re needed. 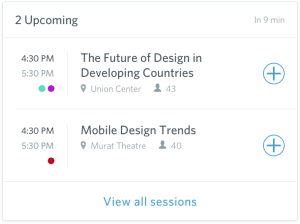 Now attendees can now spend less time searching your app and more time enjoying it! Let’s take a look at the types of app content Interact includes on its feed, and what that means for your app’s users. You’ve spent countless hours preparing the schedule for your event and you want all of your attendees to experience as much of it as possible – but other than browsing the entire schedule, what’s the best way for them to find what they should attend? 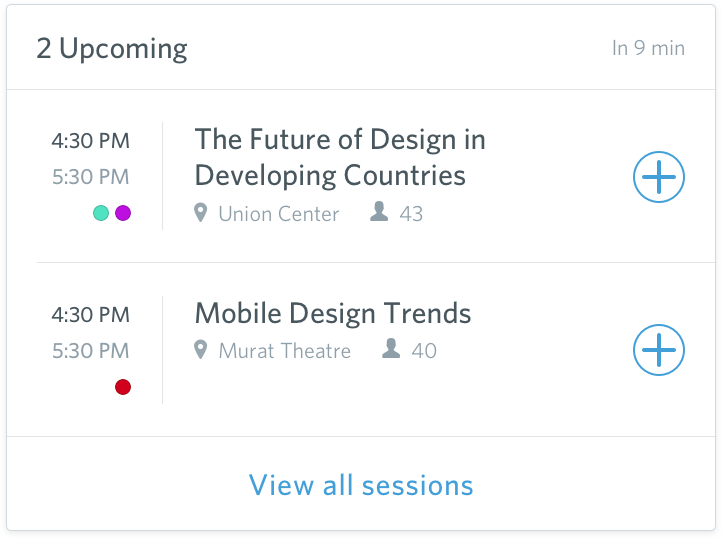 Interact introduces session cards into the feed to help promote upcoming sessions, popular sessions, and sessions with attendance caps. You’ll never hear “Oh, I didn’t know that was happening” again. Session cards are personalized to each attendee and will act as a reminder for sessions they add to their own schedule. 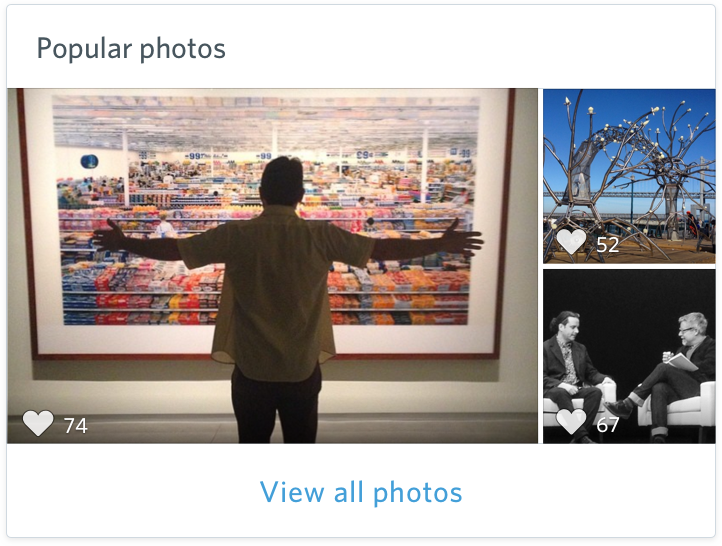 Using the shared photo album within Guidebook is already a fun way to increase engagement. 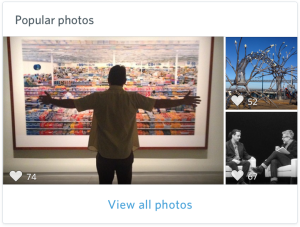 Now Interact will showcase the most popular and most recent photos added to the photo album. Photos create a lot of visual interest within your app and encourage people to share their experiences beyond just attending sessions and networking. With Interact, users can connect and engage with each other in an entirely new way. People have the power to post their thoughts, feelings, opinions, and questions on Interact. You can even drive the conversation by asking provocative questions or prompting discussions right within the feed. Maybe attendees really enjoyed a session, have a question about the venue, or are looking for a few friends for lunch. Interact is the perfect place for all of these conversations! Have a last minute room change for a session? 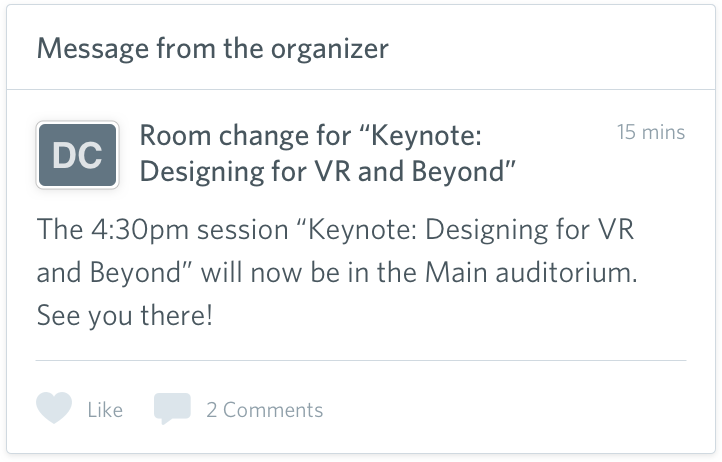 Excited to announce a new keynote speaker? Post directly to the feed and share the news! Similar to a push notification or an Inbox message, this card allows instant communication with your event attendees (with a little added authority since it’s coming straight from you). Want to help your users capitalize on networking opportunities? Our attendee card will show the check-in activity at your event and help recommend connections. 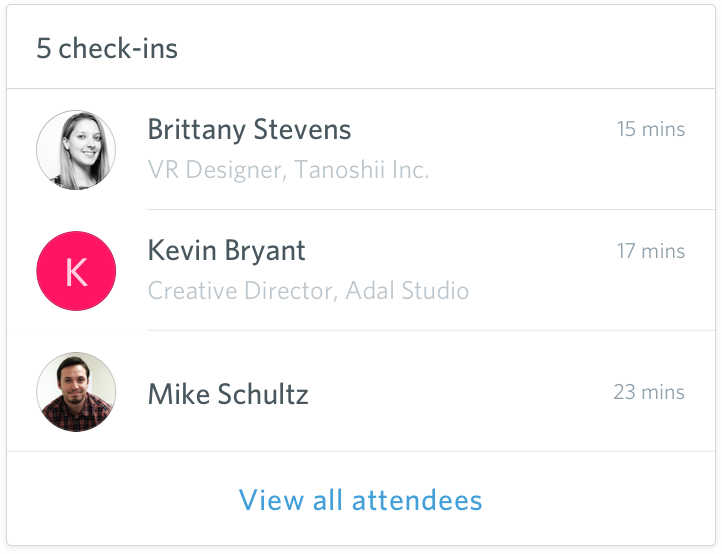 This is an easy way for you to see how many users are actively engaged with your app, and an even easier way for other attendees to see who they might want to meet up with. 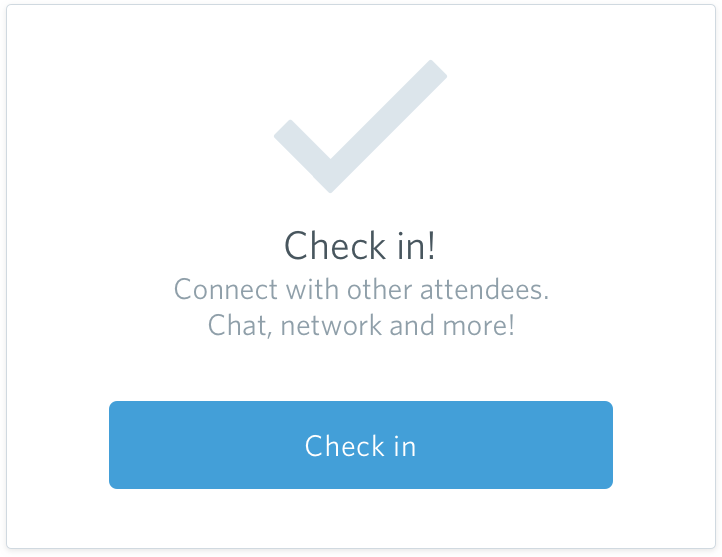 Our check-in card will help improve the number of attendees who choose to create a profile within your app and, as a result, will continue to stir the networking pot. This prominent reminder is the perfect way to help boost the number of people actively using in the app and adding to the social atmosphere of your event without being overly aggressive about it. Interact is driven by a special homegrown algorithm that mixes highly-ranked content in your guide with posts from both you and your attendees to provide the right information at the right time. That means no active management on your part. It literally takes care of itself like an engagement-boosting machine! If you do need to pull down content, however, we’ve made sure that’s easy to do as well. Looking for some tips & tricks on boosting your attendee engagement? Look no further! Click the button below to download our handy eBook and make sure your next event is a hit. How can you make sure people use Interact? Encourage your users to download the app – the higher the usage, the better the recommendations. Lead the conversation – ask your audience a probing question. Did you have a new keynote speaker this year? Wondering if you picked the right catering spread? Ask your attendees their thoughts! Make it your app’s home screen. If your Interact feed is front and center, every time your users launch your app they will see the most up to date cards and can explore the latest social posts. Going deeper into the guide from there is as simple as tapping a card! Everybody gets something out of it when an app includes Interact. Interact offers you unique insights during the event. 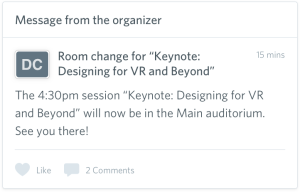 What are attendees talking about? Are they using your app? Which sessions are most popular? Are the sessions with limited attendance filling up? Are attendees checking in? Stop flying in the dark, and get a window right into what attendees are thinking at any given moment. In the meantime, your attendees are receiving insights from your app and their peers. What sessions are people attending? Who should they meet? Where are meet-ups occurring at the end of the day? What’s the best brewery in town? You’ve done the hard work of organizing and planning your event. Now let Guidebook do the heavy lifting of getting people contributing, sharing, and engaging. All you have to do is add Interact! Try it out now by creating a guide with Guidebook.